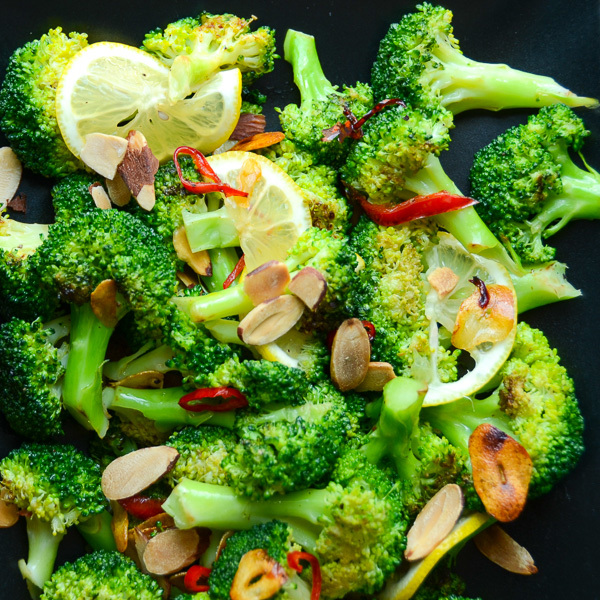 Looking for an easy side dish recipe? 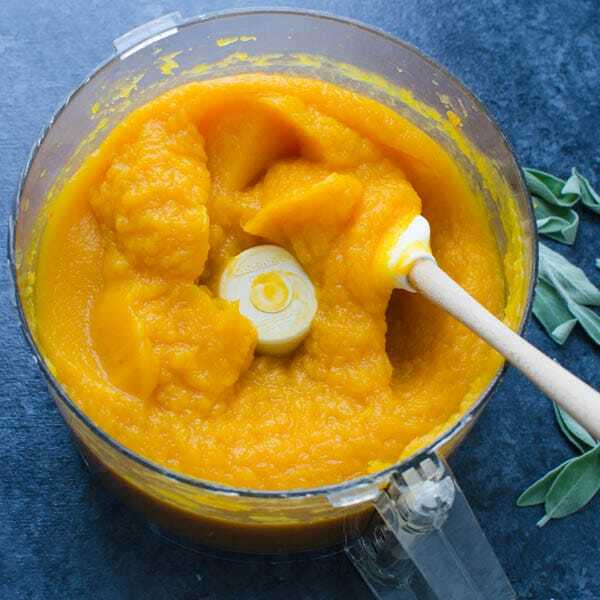 You’ll love this maple butternut purée. 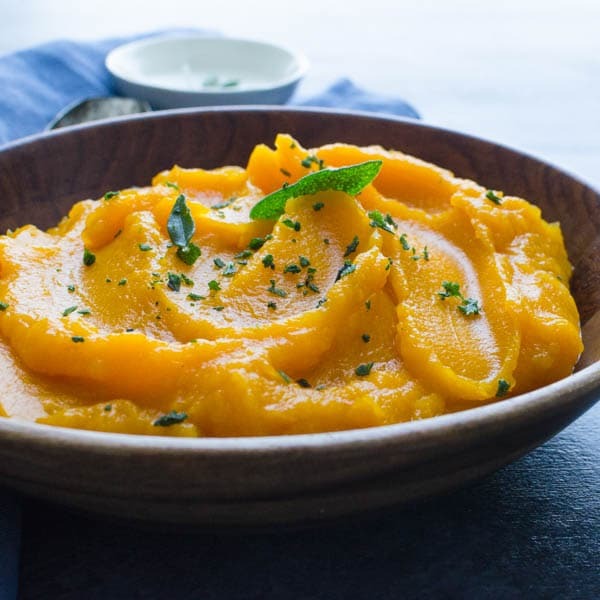 It’s silky and creamy with no cream added and this squash mash topped with crispy sage makes a great everyday and holiday dish. It’s vegan, dairy-free and irresistible. I’m not throwing shade on mashed potatoes, but let’s face it, after a serving (or two) you’re likely to feel the food coma closing in. That’s why cauliflower mash is so popular — no carbs, no bloat. The same is true for this maple butternut purée with crispy sage. It’s light on your waistline, but abundant in flavor. Just 6 ingredients make this vegetable mash an easy, delectable side dish that will up your dinner game. TBH, as a kid, I was anti-squash. Mostly because my experience with it, didn’t go beyond boiled (or rather, over-boiled) with just a pat of butter, salt and pepper. Blech. No more. Butternut squash has now become one of my favorite fall vegetables. 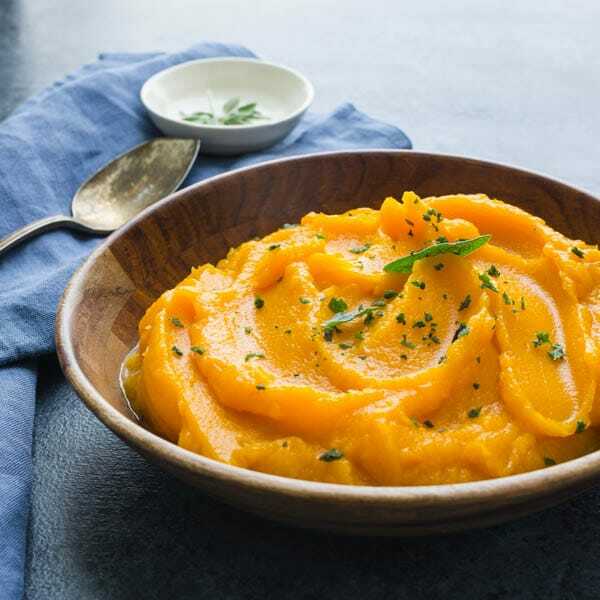 I love its tender texture and barely sweet flavor, in fact, it’s the mild flavor that lends itself so perfectly to a butternut puree. Peel the squash with a vegetable peeler. Carefully cut the squash in half, vertically. OK — I mean CAREFULLY. These things are HARD. If you don’t have a proper knife — like a REAL knife (not one of those Target specials for $15.99), do yourself a favor and buy the squash that’s already cut into cubes. (You don’t want to lose a digit because of inferior equipment). Scoop out the seeds with a tablespoon and discard. Cut the squash into 1″ cubes. Drain the butternut squash in a colander and transfer to the bowl of a food processor. Pulse to puree the squash. 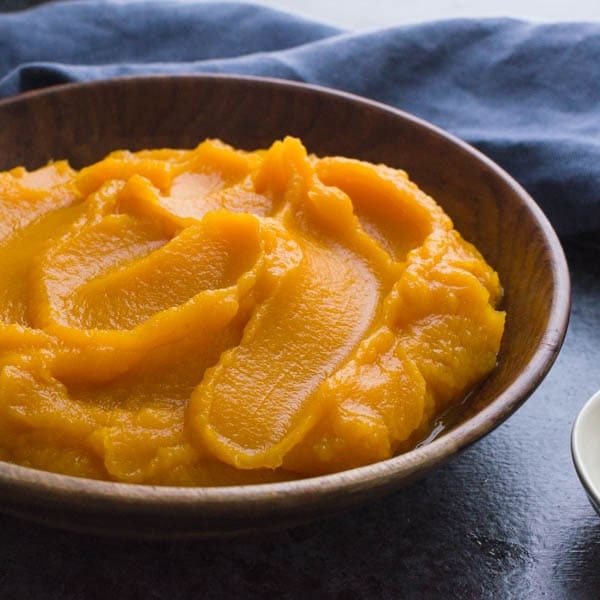 Transfer the maple butternut purée to a serving dish. Top with crispy sage leaves as a garnish if desired. You can certainly serve the butternut puree without the crispy sage leaves (I’m not the food police) or if you wanted to try another topping, you could just sprinkle on some fresh thyme or a little smoked paprika – or for crunch, some buttered breadcrumbs. It will still be a hit. 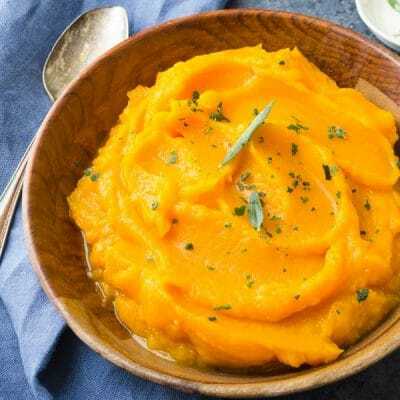 This easy butternut squash puree is subtly flavored with balsamic vinegar and maple syrup for a tasty, vegan side dish that's great with pork, chicken and seafood. Peel the squash with a vegetable peeler. 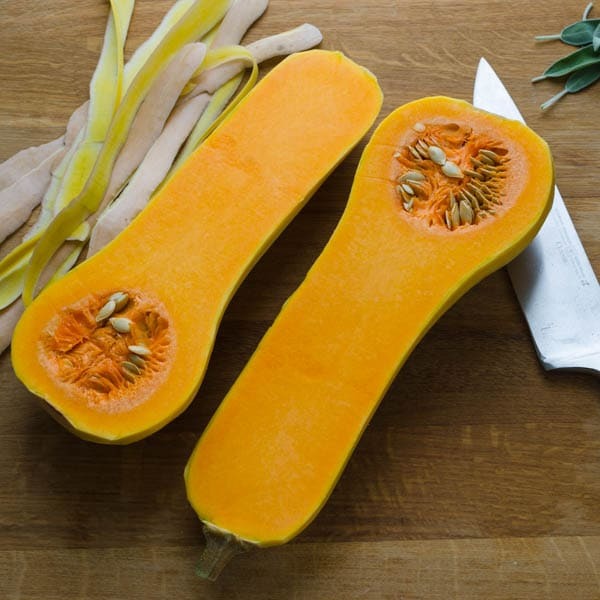 With a very sharp chefs knife, cut the squash in half lengthwise. Use a spoon to scoop out the seeds - discard. Cut the squash into 1" pieces. Fill a saucepan half way with water and heat to boiling. Add two teaspoons kosher salt to the water as it reaches a boil. Add the butternut squash to the water, reduce heat to a rapid simmer and cook for 10 minutes or until the squash is tender. Remove from heat and pour the squash into a colander to drain. Let the squash sit for 2-3 minutes so the liquid can evaporate. In a small skillet, heat the olive oil over medium high heat until its very hot and the oil slicks across the pan. Add the sage leaves and fry them until crisp. Remove from heat. 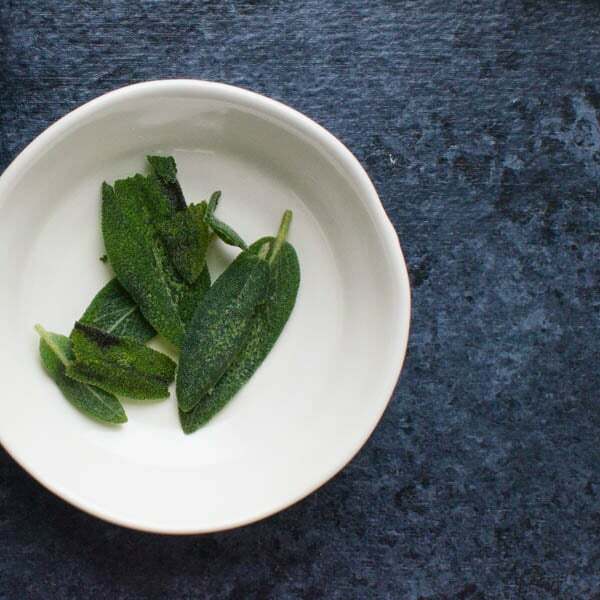 Transfer sage to a paper towel lined dish and set aside. Transfer the squash to a food processor and pulse until smooth. Add the kosher salt, balsamic vinegar and maple syrup to the puree and pulse again until well incorporated. Taste for seasoning and adjust as necessary. 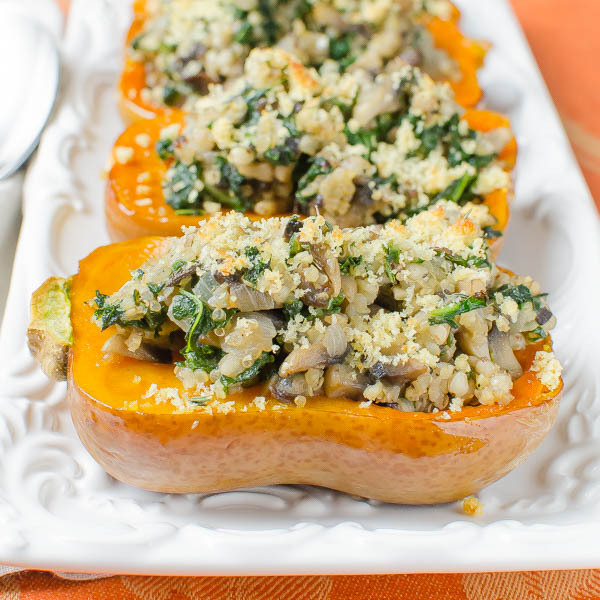 Spoon the butternut squash puree into a serving bowl and crumble the sage leaves on top. Serve. NOTE: Squash can be made ahead of time and reheated just before serving. Add crispy sage at the last minute. We grew butternut squash in our garden this year! Can’t wait to use them in this recipe! Earth Fare had butternut squash on sale this week and I bought two with no idea what I was going to do with them! Now I know!! This sounds so good and my sage plant is flourishing! 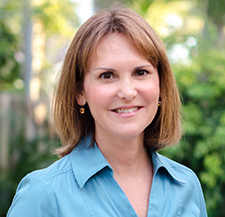 Hope you enjoy it Pam! 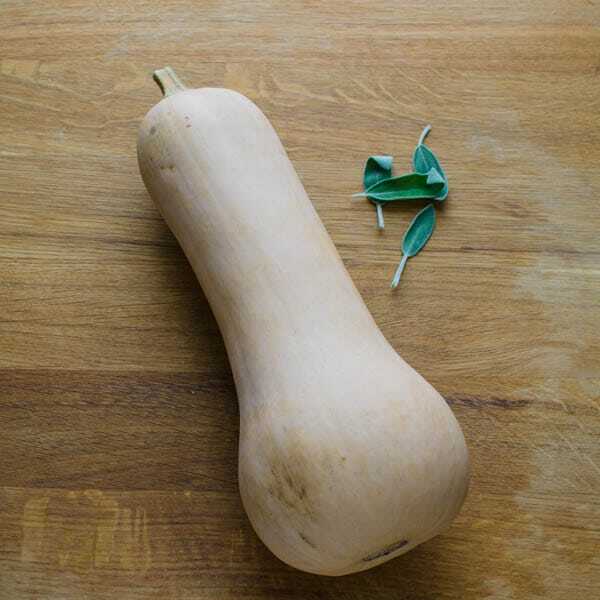 I looove squash at this time of year, you could do so much with this puree thanks so much for sharing! 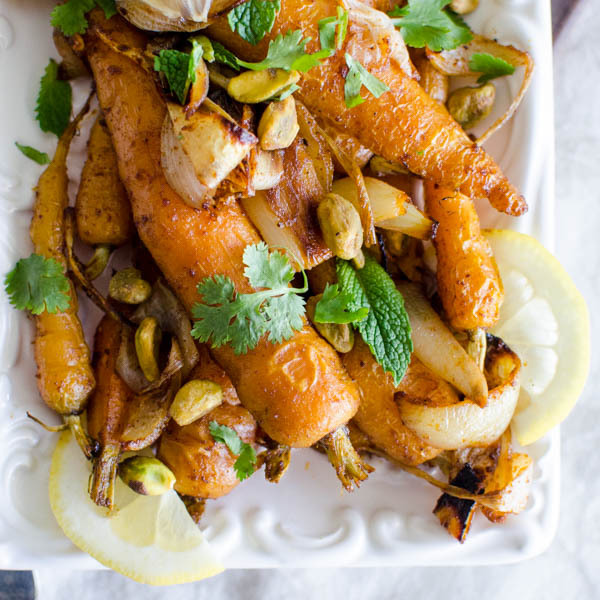 Love the beautiful color of this side dish! So easy to make and looks delicious! It’s perfect for the upcoming holidays! Thanks so much for the much-needed tips to make the puree. This will make it much easier to make I think. This recipe looks fab and I can not wait to try it. Hope it turns out as good as yours.